Welcome to smash.gg! We’re glad to have you aboard. There’s a lot we’d love to help out with, so below are some tips and tricks on getting to know your tournament page. By the end of this, you should understand the five basics to complete before showing your tournament to the world. Once you fill out the items you need to, you’ll be able to submit your tournament! 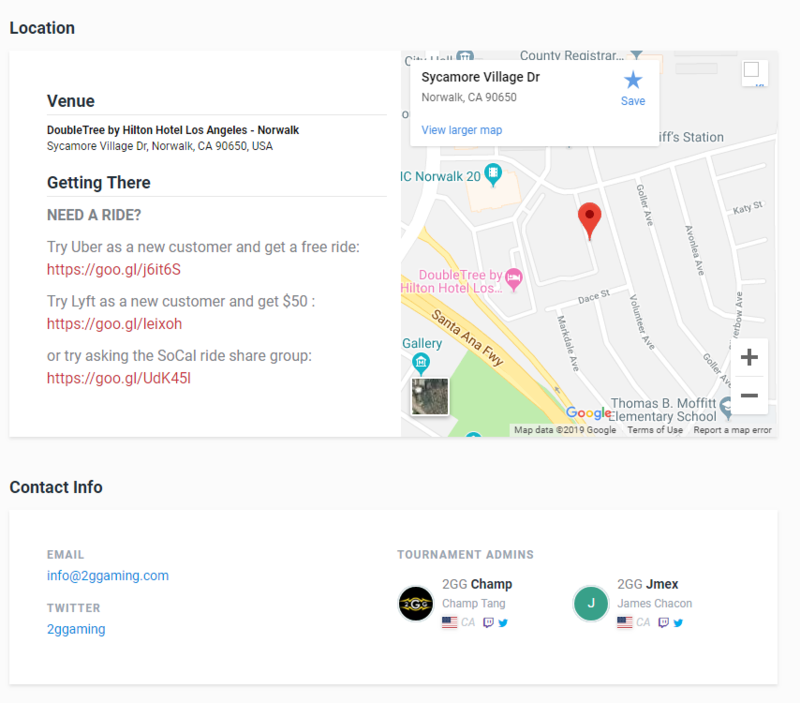 We highly recommend at least inserting a tournament venue (if applicable), contact information, and getting a short URL for your tournament. The last bit helps make coming back to your page easy! If you’re running your tournament with other people, you can add them under Admin Permissions. Select the “add admin” button and search for your team’s smash.gg gamertags (You can also search their email in the event of their tag being too common!) . You can learn more about the 4 roles you can assign in our help article here. Here you can handle what games and events are offered at your tournament. When we talk about events, we define them as a particular game and tournament format offered at your tournament. 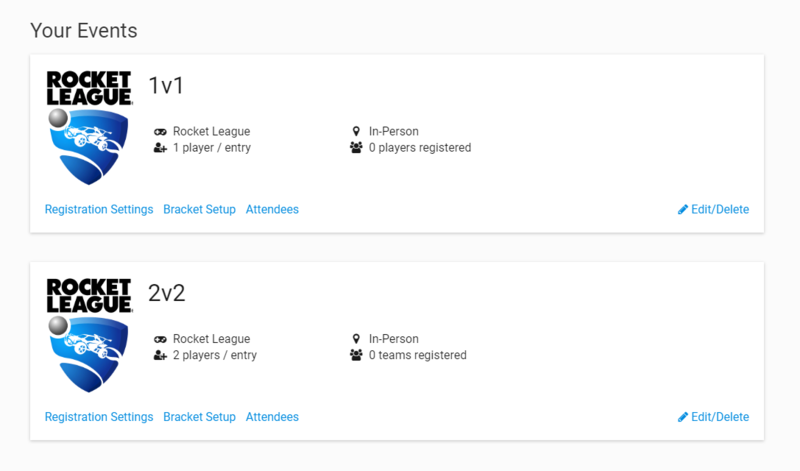 For example, a Rocket League tournament with a separate team bracket and 1v1 bracket are going to have a separate event for each. Check out our Event Creation guide for more. Simply put, publishing controls what the public can see on your page. If people are reporting errors with viewing your page or can’t access parts of it, this will be your first stop. More on publishing can be found here. In Registration Settings, you’ll set registration deadlines and customize what attendees see in your registration process. Registration fields in particular is where you can set a variety of options around venue pricing, customizing what kinds of registration are allowed, and more. We define a venue fee as the fee paid by an attendee to attend the tournament, and an event fee as the fee going towards a particular game’s event, mostly in the form of prize pools. Please note that you can only charge money for offline events, and online events must be free to enter. Whether it’s free or not, a venue fee is required for all attendees. You may have multiple types of venue registration options or simply have one. In advanced settings, you can also adjust an overall tournament attendee cap. Event fees are optional based on what events players want to enter. Note that each event made will appear here, but clicking "Edit" will take you to the settings page for that individual event. Beyond editing price, you can choose from a host of options, including whether a specific event’s registration is public or not, or setting a cap on specific events. For more on registration, check out the Registration section of our Help Center. Here you’ll see the basics of all your attendee’s information. You can also sort this list at the top by the events they have entered, payment status, and their team status. Clicking on an attendee lets you edit their basic registration options. This lets you select what events they have entered and whether they have paid for paid events - useful for tracking day-of signups. Additionally, you'll be able to see whether a player is "Verified". Any player who registers themselves is verified. Any manually-added player with a smash.gg account who has not confirmed being added to the tournament shows as "Pending". Any manually-added player who does not have a smash.gg account shows as "Anonymous". For more info on attendee confirmation, click here. On the top right you’ll find two buttons. The “export” button lets you export a spreadsheet showing everything in your attendees’ registration (Only available to those with full administrator permissions). The "add attendee" function is further explained here. 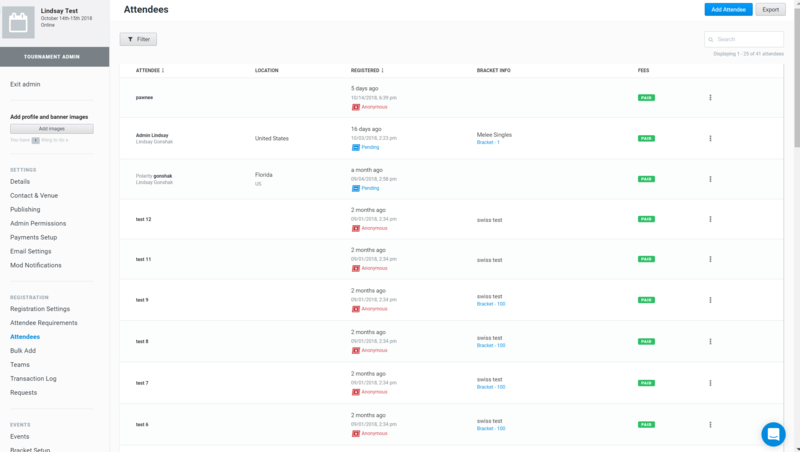 To modify and monitor teams at your event, visit the Teams tab. Read more on teams here. All users accepting payment should visit the Payment Setup page. To enable cash payments, hit the Enable Onsite button. Players who select this option during registration will be marked as Did Not Pay, or DNP, in your attendees list. 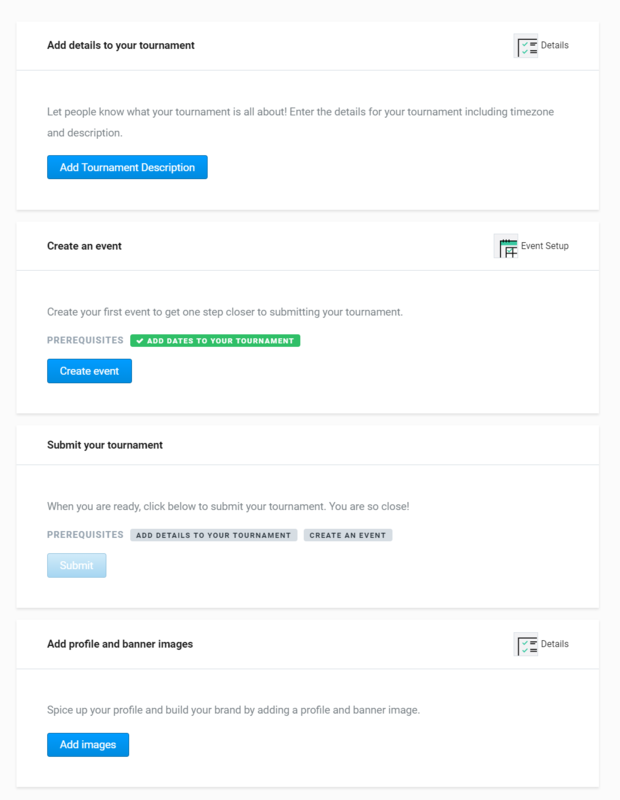 For Paypal and Stripe, you can connect your accounts to a tournament page, linking all registration payments to those accounts. You’ll want to enable at least one of these options for any paid tournament. Read more on payment options here. 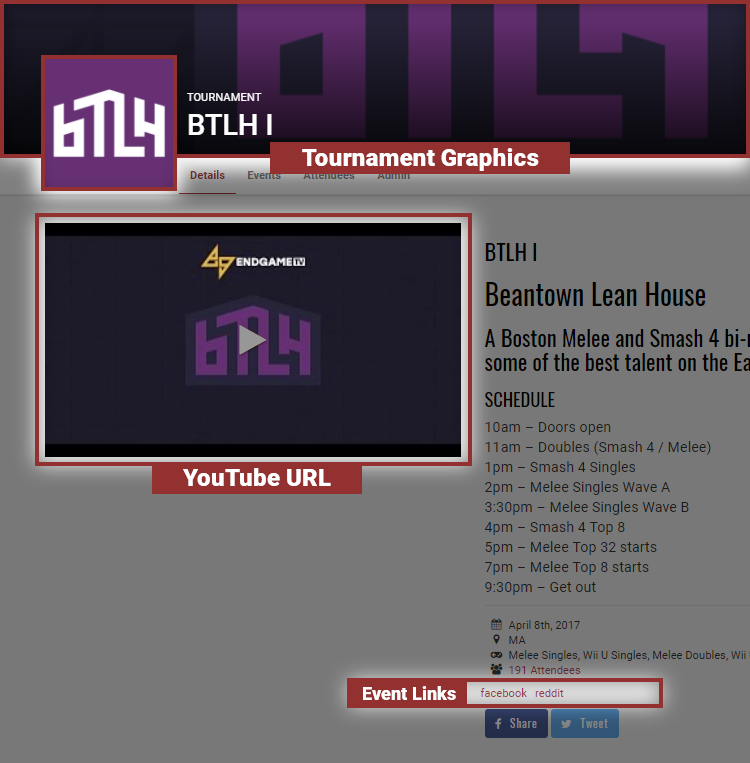 Congratulations, your tournament page is now ready to go live! You can press the Submit button on the Things To Do page to submit your page for approval, and it will usually be approved within 24 hours or less. Be sure to make your page public in Publishing and use your short URL to advertise your page. Next up? Scheduling and brackets. You can find all that and more below!